This is a carbon map showing where on the specimen carbon molecules are located, Selden explained to Gizmodo. 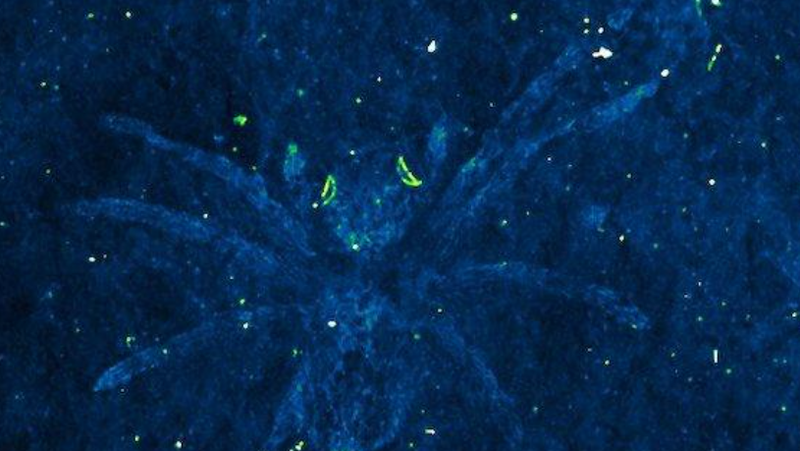 A new spider fossil discovery included a surprising find: remnants of reflective eye tissue. Though common today, spiders don’t appear much in the fossil record because their soft bodies don’t preserve well, according to the paper published in the Journal of Systematic Palaeontology. This is the first time one family of spiders has been spotted outside of amber, and the first time that the reflective eye tissue of a spider has been found in a fossil. “It’s opening up a whole new world about how these things lived and how they would have caught their prey,” Paul Selden, one of the paper’s authors and director of the Paleontological Institute at the University of Kansas, told Gizmodo. A Korean high schooler and amateur fossil hunter named Kye-Soo Nam first found the fossils in 112-million-year old Cretaceous-period rock called the Jinju Formation in South Korea. The formation has yielded tons of other fossils, including plants, mollusks, fish, and dinosaurs, and an unidentified fossil spider species. The new research analyzed 10 spider specimens in dark gray shale, viewing and measuring them under microscopes. The scientists determined that they represented seven different species. That alone is surprising, and demonstrates that there are probably a lot more extinct spider species out there yet to be discovered. Some of the fossils came from the Lagonomegopidae spider family, the first time such fossils have been found outside of amber. But finding the spider preserved in stone, rather than in amber, let the researchers see structures they hadn’t seen before, such as the reflective eye tissue. This discovery allowed the researchers to infer quite a bit about these spiders’ behavior. The specimens showed “quite remarkable preservation” of canoe-shaped pieces of reflective tissue in the spiders’ eyes, both apparently visible in the fossil itself and highlighted when the researchers analyzed the chemical makeup of the fossil. They interpreted this reflective tissue as the tapetum, which the eyes of some animals (but not humans) use for seeing in dim light. It’s why pets and other mammals often have bright, laser-like eyes in photos taken with flash. You might wonder how the researchers determined that they were looking at the tapetum and not anything else. According to the paper, since the spider tapetum is formed from crystals of the molecule guanine, it would be more likely to be preserved than other soft tissues. “Moreover, the shape of the structure—clearly canoe-shaped,” confirmed their suspicions, they write. Each new fossil discovery adds more details to the story of life on Earth—a story that may never be complete. But in addition to learning more about ancient spiders, it’s pretty awesome to see the glow of 112-million-year-old spidey eyes.